SINGAPORE - Most of the 16 town councils have performed well in areas such as estate cleanliness and lift maintenance, according to the Ministry of National Development's (MND) latest Town Council Management Report on Monday (May 30). There was, however, room for improvement for some in estate maintenance and service and conservancy charges (S&CC) arrears management, the report said. The report assessed all town councils under the four indicators from April to September last year. Each indicator uses three colour bands - green, amber and red - based on measurable objective criteria submitted by the town councils and their auditors. 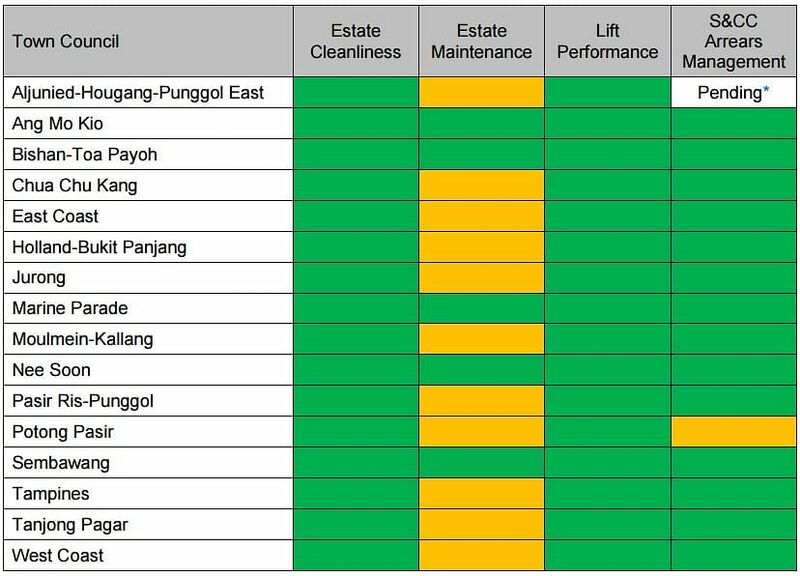 All 16 town councils were banded green in estate cleanliness and lift performance. And all except two scored green in S&CC arrears management. Potong Pasir was banded yellow, the same as in 2014, while the Workers' Party-run Aljunied-Hougang-Punggol East Town Council's (AHPETC) score was listed as pending due to the ongoing review by its auditor, KPMG. While MND said AHPETC had confirmed that the reports were prepared in accordance to its requirements, it noted that KMPG had made two observations in its May 13 report. KPMG had compared the accounts receivable sub-ledger, used by AHPETC to calculate S&CC arrears attributable to the Sinking Fund, to the numbers in the FY2014/15 audited financial statements, and they did not match. The town council is investigating the reasons for the difference. AHTC chairman Pritam Singh said in a statement that the town council has noted MND’s remarks on S&CC arrears. AHTC will continue to publish on its website (www.ahtc.sg) all monthly KPMG reports for the public to track the progress and resolution of this issue. "AHTC would like to thank its residents for paying their S&CC promptly. Residents who are unable to make payment by the first day of each month are strongly advised to visit the Town Council or see their respective MPs who will assist them, wherever possible," he added.. Meanwhile, only five town councils - Ang Mo Kio, Bishan-Toa Payoh, Marine Parade, Nee Soon and Sembawang - scored green in estate maintenance. The rest were banded yellow. The report noted that the obstruction of common areas remains the top estate maintenance issue, accounting for more than a third (36%) of the total maintenance observations in FY2015. It warned that such obstructions were fire hazards and could hamper evacuation efforts during emergencies. There will be no report for the period from October 2015 to March this year, as MND said most town councils were in the process of handing over properties to each other, due to the 2015 General Election. Accountability for results during this transitional period would therefore be unclear, MND added. The public can access the full report at www.towncouncils.sg and provide their feedback at tcmr_feedback@mailbox.hdb.gov.sg or directly to their respective town councils.